Bimbadeen is a working farm located on Back Beach Road near Ventnor, Phillip Island. As well as offering retreat accommodation, farm tours are also available to visitors. There is a shop selling their own farm produce such as eggs and honey, plus fresh vegetables. The café provides light meals and coffee. 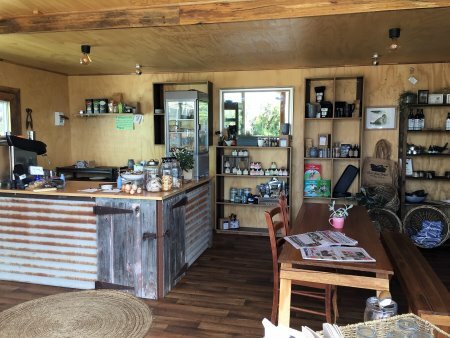 The shop and café are perfectly situated on a sunny sheltered deck overlooking Black Angus cattle grazing in the paddocks - it is a lovely rural idyll. The deck area is also used for the “Paddock to Plate” barbeque, featuring Bimbadeen beef, eggs and other local produce. The barbeque can be booked for before or after your farm tour. We book a 3.00pm tour on a Saturday and a group of 12 sets out to learn about Bimbadeen. Steve (one of the owners) talks about the history and philosophy of the family in how the farm is run, with them trying to achieve a carbon neutral property. He is ably helped during the tour by Mosen. In a good year there are about 300 cattle on the property, with around 170 in a bad year. It is calving time when we visit so there are lots of gorgeous little black calves. We walk a short distance to the sheds, spotting the farm’s bee hives, the home to about a quarter of a million bees. They are busy making honey from the spring flowers. The shed holds huge rolls of hay, used for animal feed. Some rolls are wrapped in black plastic. These rolls are called silage and exude a sweet odour of fermentation. Silage is used for fattening the cattle for market. In the next door shed are two pigs, fed on spent grain used in the fermenting process by Ocean Reach Brewery in Cowes. There are some hops planted near the retreats to provide hops to the brewery. The pigs are kept as a reference to the farm’s history as the property was originally a pig farm. Mosen drives us to the four paddocks where the hundreds of Isa Brown hens really do rule the roost! The hens are allocated to paddocks depending on their age – as they age their rich brown plumage lightens in colour. Each paddock has a mobile caravan where the hens roost and lay their eggs. Visitors can help collect them! 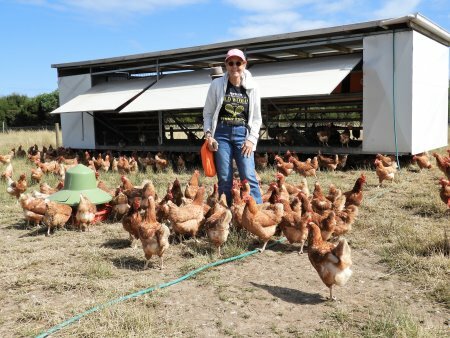 The hens produce hundreds of free range eggs every day which can be bought at the farm shop or at various outlets on Phillip Island. 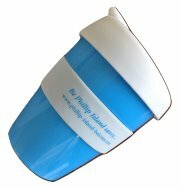 The egg producing component of Bimbadeen is possible because Phillip Island is now fox free. 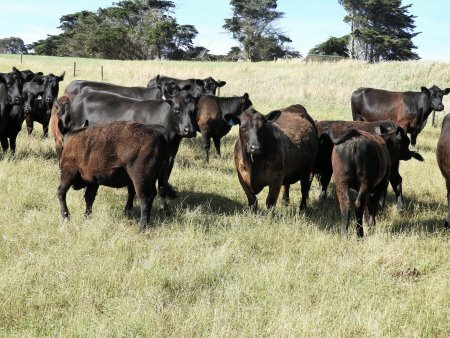 This has been a very long process undertaken by Phillip Island Nature Parks to protect the island’s wildlife but obviously has other benefits for farmers! We drive to Hurricane Hill. In the paddocks along the way there are lots of Cape Barren geese grazing – they are not the farmer’s friend however as their numbers have increased greatly in recent years! Hurricane Hill is the second highest point on Phillip Island, after Cape Woolamai. The name becomes obvious when we reach the summit and the wind hits! There are spectacular 360 degree views over Phillip Island, from Bass Strait in the south to Westernport Bay in the north. Part way up the hill is a water bore, the water source discovered by dowsing. The water is used to feed the stock, the pump being run by solar power - another part of the attempt for the farm to be carbon neutral. 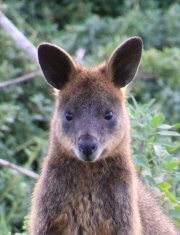 On the way back we drive into a paddock where there are about a dozen swamp wallabies – it is now getting on to late afternoon and that is when they come out to graze. As well, we surprise a hare – a not very common sight on Phillip Island – which bounds away to safety. 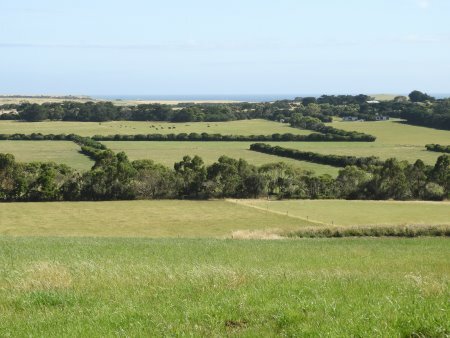 Crossing the farm is a wildlife corridor which continues right across Phillip Island and allows the movement of wildlife away from roads. We visit the farm’s two alpacas, Freddy and Eddy, with Freddy very happy to give visitors a kiss if you offer him your cheek! Spot, the very woolly sheep, shares the enclosure and you can feed him some grain although he can be very keen to hog the bucket! Near the café/shop there are three retreat cabins – perfect for a quite getaway of if visitors want to attend the nearby grand prix track and penguin parade.